Search Engine Optimisation (SEO) is defined as the process of affecting the visibility of a website or a web page in a search engine’s unpaid results – often referred to as “natural,” “organic,” or “earned” results. All the main search engines – Google, Bing and Yahoo – split their pages into organic results where the position of a website is decided by many ranking factors built into the search engine’s algorithm. Above, to the right and at the bottom of the organic results, you’ll often find the paid advertising where people have bid an amount – a Cost Per Click – to have their ad triggered by a particular keyword. It is, however, the organic search results that keep people using search engines and they are only interested in linking to websites that provide the best user experience: good answers or solutions to their search query. If they link to useful, relevant websites then people are more likely to keep using the search engine, tell other people and occasionally click on an Ad generating revenue – an industry that is now worth billions. 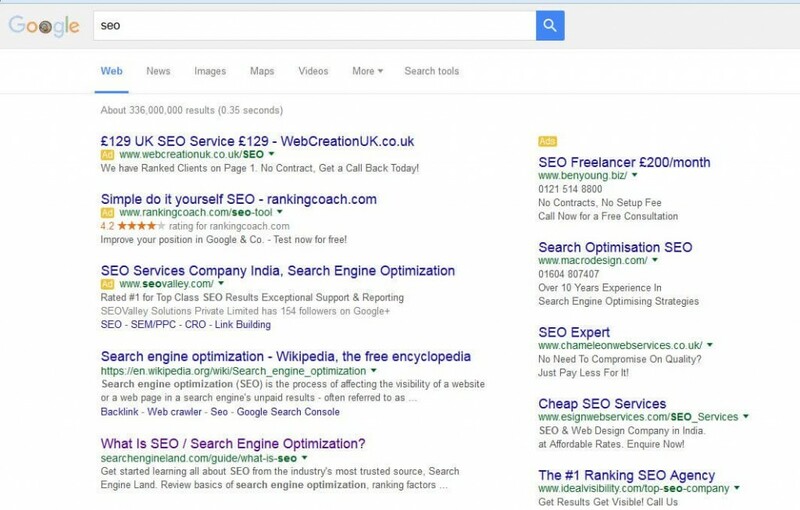 Search results from a query seo, note the orange Ad icons for pay per click advertising top and right, with the organic results on the left. It’s a vast subject and, if we’re honest, there’s a lot of snake oil salesman out there promising stellar results but are at best ineffectual and at worst could damage the ranking of your website on search engines. Let’s cover some of the basics now so you can be better informed about investing in Search Engine Optimisation. First and foremost, SEO done right can boost the ranking of your website on Search Engine Results Pages (SERPS). It’s an imprecise science so it’s hard to predict by how much and when this occurs, but treat it as a continuous process of making small improvements or marginal gains and you will benefit. Do keyword research – know what potential visitors are typing into search engines and include these on your website pages and tags. Design and setup your website properly – for example, useful content, calls to action, mobile friendly pages, page speed are all factors that search engines measure and therefore influence the position of a website on search engine results pages. Keep improving and enhancing the website, adding or revising content to improve the user experience. Seek opportunities for natural, relevant backlinks to your websites from good quality websites. Only consider quality websites and disavow poor quality websites if necessary. Promote the website using social media, traditional marketing Pay Per Click advertising and, of course a properly planned SEO campaign. Analyse website data and other key performance indicators such as enquiries, revenue, social media likes, followers and shares. Keep up with the latest changes to the way search engines index websites.